The Moscow police disclosed this week that they have decided not to investigate Alfa-Inform, a Moscow security agency, after an individual describing himself as an employee of the company made a telephone threat to put John Helmer in a wheel-chair unless he removed documents relating to Alfa-Inform and Rusal from this website. The posting to which the caller was referring was this. It revealed that the Alfa-Inform report on Helmer’s whereabouts and movements — found after a police search of a car belonging to three men arrested on December 28 after they attempted to enter Helmer’s apartment block in Moscow — had been tampered with, and that a forged version had been sent to the Moscow court reviewing the police investigation of those incidents. 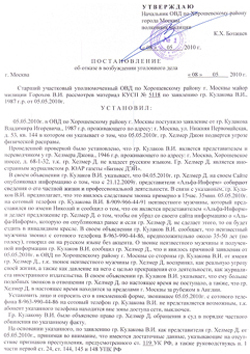 Soon after the threatening call was received on May 5, Helmer filed a new complaint with the Khoroshevsky raion OVD. This was registered as a new case KUSP-5118. 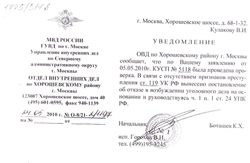 These documents were not made available to Helmer and Kulakov until June 7, two further weeks after Botashev had signed off on them. There has been no explanation for the delays. A source close to the investigation said that it was not possible for the police to get access to the registration data for the telephone number used in the threat call unless a criminal investigation was opened officially first. Also, the police did not question Alfa-Inform as to whether it employed a person or persons named Nikolai, and what mobile telephone numbers he or they might use. In the interval between investigating and not investigating the threat call, on May 18 Judge Elena Tsyplakova of the Savelovsky district court of Moscow over-ruled the police recommendation to close the first investigation of the plan of threat and attack against Helmer by men who were employees of Alfa-Inform. A criminal investigation has now been opened in that case, and involves both police investigators and officers of the Federal Security Service (FSB). The authentic version of the Alfa-Inform report, which was registered by the police on December 28, and reviewed by the FSB, has been secured. Three names are under investigation in addition to those arrested on December 28.